For any journalist, aspiring or qualified, the opportunity to work at one of the worlds most renowned and recognised broadcasters is simply one too good to be missed. For me ambitions and aspirations of seeing the ‘beeb’ in its full glory were fulfilled on a two-week work placement earlier this month. And what an exciting and thrilling two weeks they turned out to be. There is something simply surreal about walking into a glass-fronted office tagged with the famous BBC logo from the outside throughout to the inside of the MediaCityUK building. The complex in Salford is superbly stunning. Visually, the array of BBC and other media buildings create a modern and fresh environment. On the inside, the offices are minor in comparison to the stunning panoramic views of Salford Quays. It truly is a wonderful working environment. Having had experience in newspaper journalism, it was an opportunity to see how television news and journalism actually works. So often, as a viewer, we take for granted the end product of a news programme, forgetting the long hours that have gone into producing a regional programme. I approached with moderate expectations – journalism is an industry where deadlines must be met and where journalists often have their own job to do. However, I was surprised at how warm and engaging some of the staff, producers and journalists alike, were in talking about their roles and offering sound advice. Much of the fortnight placement involved research, a key component in the journalism and media jigsaw. Working with the BBC’s Sunday Politics team, it was an eye-opener to understand how much research has to take place in order for a report or programme to look and sound professional. Doing research, to some, may sound boring, yet it doesn’t have to be. Selecting and compressing opinions, ideas, facts and figures really helps understand a particular story and in turn gives the average viewer a broad sense of the story they are interacting with. My enjoyment of simply working in an office and doing something I am passionate about made what could be a tireless and repetitive role become alive. So you would understand my overwhelming joy of shadowing some of the journalists of leading regional news programme North West Tonight. My time spent with the reporters was invaluable. Never before could I ever guess it would take up to three hours to simply film and interview for a 1 minute 45 second piece. Visiting a man who had collected one thousand music albums, an urban artist in Manchester and the cast of Peter Pan certainly gave me flavour of the lighter side of journalism, whilst input, discussion and research into stories such as fracking and ‘troubled families’ emphasised the variation in this fascinating sector. I did begin to learn and understand some interview techniques. Simply asking questions in everyday life is evidence of probing and journalistic skills. In the modern multimedia environment, I was both surprised and un-surprised at the changing roles that journalists have to play. Surprised, I was in awe that journalists, reporters and correspondents are simply more than the question asker and the person who speaks to the camera; their roles consist of editing their pieces, choosing library footage, adding music and writing scripts, something I presumed was conducted by another member of the team. The journalist of today also plays the role of the editor and, at times, the role of the camera person. When reflecting, it wasn’t really a surprise at all. The level of new media and technology must be used and so it makes sense for editing to be done all by one multimedia, cross-platform journalist. Work experience at the BBC is notoriously hard to get and so I was very surprised to have received a phone call from the recruitment centre. The way to succeed on any journalism placement, not just at the BBC, is to show passion and interest in the sector you are working in. Ask questions about a journalists role, speak to the producer and ask about doing specific things, such as sitting in the gallery of a live news programme. Always ask for advice on how to make a good career out of the industry, but know when to take a back seat. Engage in ordinary conversation. It could be as trivial as something about the weather or as serious as a little bit of input into a production meeting. If you are assigned a piece of research, go above and beyond what you’ve been asked, and if there is a deadline to meet, then meet it. I talk of asking about advice and what follows is the general consensus of advice I was given by a whole host of journalists and producers. – Work Experience. Possibly the most important factor. The more experience you have, the more shaped you are to the job and perhaps the more passionate you appear. –Qualifications. Previously not really essential, but today journalism postgraduate courses are highly recognised by a number of universities and courses by the NCTJ. Some undergraduate courses are good, but are perhaps a little too narrow. –Connections. Using social media and emails to connect with journalists, editors and producers. Sometimes having an email contact you can update can make all the difference. Above all, to me, aspiration and passion is what is essential. Being persistent, determined and strong-minded is all essential not just for a career in journalism and the media, but for anything in any walk of life. At the time it was a pioneering moment. Broadcasting news and having journalists report on national, international and regional stories. It is difficult to think of waking up without some programme providing an early morning dose of headlines and information. There was a time, however. Today, the market for breakfast television is greater than ever before. The consequence is a decline in viewers of early morning television journalism. Our busier way of life, the increasing demands of work and economy, and demanding childcare has confidently led to dwindle in the number of viewers who want news at breakfast. It’s very much a subconscious thing. Automatically, many households head straight to a news programme. Ensuring children and pets are fed and cleaned, getting to school and work on time are the tasks that become mundane and routine. Journalism and news are simply background to the lifestyle that so many lead and it can become very easy to either avoid news or simply take these programmes for granted. In its greater and younger life, ITV’s breakfast offering, GMTV, managed to inform, entertain and connect with the millions of loyal viewers who regularly watched the award winning programme. Today, it’s successor, Daybreak, averages less than one million viewers a day. A sharp decline. Even before ITV took full control of its breakfast content, journalism on GMTV wasn’t groundbreaking. Reports were short, often gimmicky and a bit ‘cheap’ compared to other options. However, as it attracted an overwhelmingly large audience, politicians ensured GMTV was a regular for any interview. Although not having a strong journalistic background, the connection and rapport between presenters and audience paved the way for interviews that were truthful, honest and audience orientated. Perhaps tacky around the edges, but the balances between news, celebrity and real lives made GMTV somewhat the must watch breakfast programme. An understated and less pompous approach to journalism which clearly is what the audience wanted. The demise of GMTV was partly down to its own making. Accusations of fraud and misleading viewers in competitions led many of its loyal and regular viewers away. The demise of the programme had begun. At the same time, the BBC’s traditional hard news approach to early morning viewers was about to change. When it comes to searching for reliable news, business and regional news updates, viewers seem to intuitively choose the BBC over other rivals. It was the ‘beeb’ who began the breakfast phenomena in 1983. Soon, the format changed to desk based news, attracting a substantially smaller audience than the more family orientated GMTV. It could, therefore, be presumed that even back in the late 1980’s and 1990’s, perceptions of news and hard journalism were ‘boring’, similar to some modern day ideas. Today, the BBC’s Breakfast programme captures little over 1.5 million viewers compared to ITV’s Daybreak 700,000. The programme is now completely sofa based and mixes viewer interest with the news and sport headlines until 8:30 when the focus shifts to entertainment and culture. To me, there is something universally exciting, exhilarating and attractive about waking up to an unexpected breaking news story. Certainly the moment I heard about Michael Jackson’s death via BBC News or the rescue of the Chilean miners are amongst the stories that represent the absolute need for news at breakfast time. However, as numbers for programmes such as Breakfast, Daybreak and Sunrise all fall short of past lives, the facts show a change in the way we, as viewers, receive our news. Viewer habits have certainly changed considerably. Gone are days of national newspapers over cereal, in are the days of watching virtually anything on TV. Given the increased demand of work and childcare, there is much criticism of television journalism in the early morning. Clearly BBC Breakfast proves to be a successful formula of news and entertainment (with a mix of light hearted features) yet there was much scepticism when the programme left London bound for Media City, Salford. Some suggest the quality of the programme has deteriorated and it is true that there is less ‘newsier’ content than in years gone by, however the overall feel of the morning programme feels identical, if not better and stronger, than when it was homed in the Capital. The idea in bringing in less news and more features represents viewer interests. It may feel like endless padding to fill the programme with content, but it is a more friendly approach to journalism that viewers want. The One Show represents a popular magazine programme with some journalistic content; it seems many of our breakfast providers want to follow this route in hope of attracting a large audience, at times forgetting the real reason behind their own early morning programmes. For many, the news represents a dark outlook, at times bias, and at others completely downbeat. Yet if we consider it a bit more, the news often shapes the day that will follow. Morning conversations, in work or elsewhere, relate to what the days news agenda is built of. The news, of which we all have opinion, not only builds our days, but often shape our lives. Certainly for those like me, aspiring journalists, breakfast news programmes provide a strong base for experienced and new talent. As rumours circulate that ITV could be about to once again revamp its breakfast output, it’s hard not to think about the alternatives to core news and journalism at such an early hour. The slide in ratings is more to do with a tarnished brand rather than the formula and content of the programme; ITV has become the provider of light entertainment held together with a small amount of news. Perhaps that is the problem. For those who don’t choose to watch the comedy offering on Channel 4, or digital news on Sky, there is not much else to offer. ITV’s timeslots can often change and are regularly governed by advert breaks, breaking traditions of regular news in a regular timeslot. Unfortunately, the commercial broadcaster doesn’t offer enough journalism to keep an audience interested. Regional news is less than three minutes an hour and the programme has often been dubbed ‘gossip-break’ given the lack of real, credible news. At breakfast, the BBC still remains the strong and professional broadcaster, despite criticisms of bias and unfair representations. That’s not to say ITV should give up. Its output on the national ITV News is, at times, more balanced and in depth than the BBC. Investigative journalism has governed the ITN newsroom in recent months and the quality of journalists, presenters and editors has grown significantly. A programme with the content of what ITV has built up would be a real rival to other news providers. Breakfast television is more a psychology subject. Questions need to be asked about what viewers expect, how long viewers can stay interested and what type of journalism they are after. To simply give up on breakfast journalism would be a tragedy. Yes, early morning news is not made up of the brand leading investigative reports, but why should it be. At that time of the morning, a summarising description of what is happening around the globe is enough. A viewer can feed on what they have learnt for an entire day. Look at radio journalism and its increased popularity. The Chris Evans Breakfast show on BBC Radio 2 attracts more viewers than both BBC1 and ITV combined. His show, a mixture of magazine, interest and interviews, strikes a core balance amongst those early morning drivers. Further evidence of a shift in lifestyle. News summaries every half hour are just the right length for the average listener and the Evans approach of news commentary certainly gains a laugh in places and applause in others. It is perhaps a clear perception that radio journalism is more popular, if not more accessible, than television journalism. Chris Evans’ lighter approach to the news must be a ratings winner, again showing that viewers do want a mixture in their media content. Subconsciously, news has become a part of day-to-day life. Notifications on social media and mobile telephones alert the breaking headlines. Conversation on national and local radio often integrate news and information. In the 21st century, it is difficult to escape from any kind of journalism. Whatever a viewer thinks about breakfast journalism and whether news should be shown or heard over tea and toast, for many the first connection of the day is the news at breakfast. 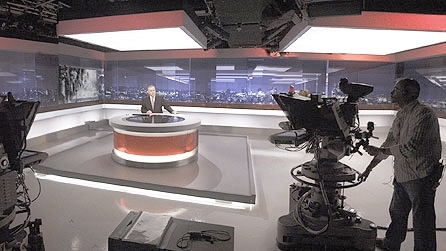 It is a live broadcast in the sense that the news breaks as the programme airs. The energy and trepidation of the journalists that bring the headlines is all too apparent. As many strive to strike the right balance, for many the news at any time of the day is a must avoid. Yet, consider how empty a day would feel without a burst of information on world events. Breakfast journalism matters. It’s actually quite frightening when I hear young people, similar age to myself, say they take no interest in the news. They don’t watch, read or listen to any bulletins. Many use the excuse that the news is “boring” and much of the content is “depressing” and “negative”. It really is a shame that people don’t want to take note of events happening around the world – the plight of famine in third world countries, alleged election corruption and natural disasters. All events have an effect on the viewer or reader. Whether it be just a simple opinion or an action you take to help. The news is for everyone and everyone must take a grasp. I have always enjoyed writing, in particular factual writing. Ever since around mid-high school (around 2007) I affirmed my desire to be a journalist. Watching the “grown up” news had me hooked from the start and I began to develop my interests in news and current affairs. At the time, many of my peer group would simply shrug off anything related to the news. Even by the end of my school life, some of my group still didn’t watch or read any news. I always remember a few people, at the age of sixteen baring in mind, stating they didn’t know there was a war in Iraq or Afghanistan. By this time the Iraq war had already started and ended. These people didn’t even know about it. All to their own, it’s a personal choice whether you watch a news programme or read a newspaper, but it was really quite fearsome that some sixteen year olds had no idea about the casualties and what the war had entailed. I suppose my love of news and current affairs goes back to before school. Quite literally. My Dad would come off his night shift at 6am and without fail would always bring in a newspaper. He still does. Whilst waiting for the rest of the family, I would take a read of the paper. If there was no newspaper, I always remember BBC Breakfast being on the TV screens. And so I was in. I would take into school and college a barrel of conversation. Discussions would take place in our lessons about some of the news agenda. Many would sit silently, wide-eyed and with a blank expression, to say they had no idea what was going on. Some just didn’t care at all. Sad. The news formed much more than an interest and passion. It developed me socially and almost everyone was aware (by the end) that I wanted to be a journalist because of my long-standing curiosity of world events. I have always seen the news as a social tool, possibly more than a factual provider of events. I know of families who prevent their children and teenagers from watching television news because of the content. It’s too “negative” and “inappropriate”, apparently. I’m afraid that’s reality. Keeping young people in particular in some sort of bubble world will do more harm than good. Inevitably there will be discussions about news events and if they can’t answer then they look stupid. I’ve seen it happen. And more so, keeping individuals in a bubble world, away from the harsh reality of world affairs, is so very damaging and detrimental to a persons view of the world. Historic images of the starving Ethiopians, the September 11th terrorist attacks and subsequent war on terror are difficult to comprehend. Emotions run high – a mixture of anger, upset and loss all depict these images. However, if they are not broadcast, consider the impact. The need to help children in poverty is vital and without the news to display the efforts of charities and the plight of the victims is degrading to all. I am a strong believer that everybody, how old or young they may be, must be exposed to the reality of global affairs. There is so much content for any age group. I always remember watching Newsround. Essentially, a news programme for children. Some of the harsh realities toned down and a duty to provide realistic and tackling issues to their younger viewer. Radio 1’s Newsbeat provides a programme select to it’s audiences of teenagers and young adults. Able to broadcast the news in a non-patronising format, yet a way that tackles the audience who may not be as interested. The likes of the ITV national and regional news are for the average mainstream viewer, varying of all ages. The content is selected for its mainstream appeal, often the ‘big’ stories of the day. That in comparison to Newsnight and Radio 4’s Today programme have a selected, high end viewer/listener and so content is selective and often more specialist. Online and news providers are at their most popular. Millions of users log on to the likes of the BBC News and ITV News websites each day, whilst Twitter and mobile phone apps have become a real force for providing news. The news is more reachable than ever. It’s not just national broadcasts that are important. Regional news is vital. Whether it be on local radio, a local newspaper or a regional news programme, the necessity for local news services are as high as ever. Take the North West for instance, my region. Granada Reports and North West Tonight are both award winning programmes with award winning presenters and reporters. Not only do the programmes tackle hard hitting news – the future of the NHS, the Morecambe Bay cockle picking tragedy and the Hillsborough Disaster to name a few – the programmes also form a base for local residents and organisations to promote their own hardship. 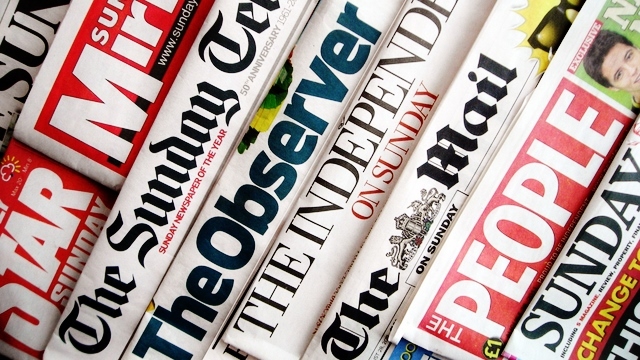 Local newspapers including the Liverpool Echo, Warrington Guardian, Manchester Evening News and so forth all dedicate space to tell readers about events local and relevant to them. Work at local charities and appeals for help are made through various regional medium. And that is what is so special about local news. It brings about a real sense of community and satisfaction when reading, listening or watching. Something everyone can take a leaf out of. There will always be people who claim they don’t watch news programmes because they are “depressing” amongst other terminology. Whilst it is refreshing when more upbeat news such as Olympic and sports success and the royal family events dominate the agenda, I always remember being told a good analogy about news. Thousands of planes land at airports around the world every hour – It’s only the plane that crashes that the news will cover. It is perhaps a rather gloomy perspective but that is what viewers are interested in. Dramatic and extraordinary events. That’s what news is all about. I believe it’s rather sad when someone says they don’t watch, read or listen to the news. It makes me think they are perhaps out of touch with the real world, real events and real world scenarios. The news impacts on every person. Political decisions touch everybody’s life. A Royal wedding brings millions of people together. Poverty ridden countries bring emotions to all who watch. Regardless of what someone’s interests are and whether they prefer politics to technology, the news is out there for everyone of all interests to take hold of. More than anything it is a duty to take an interest in news and current affairs. My favourite quote from the last 36 or so hours of intense TV coverage from the Lindo Wing at St Mary’s hospital is courtesy of BBC News presenter Simon McCoy: “I’m at St Mary’s where the worlds media is waiting for news and so far there isn’t any.” That really did sum up the theme of the television coverage of the Royal birth. A waiting game. Presenting hour after hour news with very little information to report. The work of journalists and presenters in London has to be commended. Over 12 hours of broadcasting from both Buckingham Palace and the hospital and viewers had no more information than they did at 6am on Monday morning. 45 words of a Kensington Palace statement confirming the Duchess Cambridge being admitted to hospital is what fed rolling news channels around the globe and national news programme in the UK. All of the Monday news bulletins spent a huge portion of their time live from the hospital eagerly awaiting the news. And rightly so. Anything could have happened. But it didn’t. And so you could describe it as a waste of the viewers time. Certainly on Twitter, there was frustration amongst viewers about the devoted time to the “imminent arrival”. Even those from the industry mocked the amount of time they had spent waiting for news. Throughout the “birth day” what news providers did do was create an usual art of tension and anticipation amongst the reporters and TV crews and viewers at home. #RoyalBaby was a top Twitter trender and with no updates on the progress of the pregnancy, we were all left largely unaware of what was happening and whether the baby would actually be born within daylight hours. Reminders of the traditional process of announcing the birth are now engraved in my mind for it was repeated that much. But presenters couldn’t simply hand over to the studio for other news because the birth could be at any minute. It would be the biggest scoop of the year and a hugely historic day. To miss it would be a travesty. Waiting Game: The world’s media at St Mary’s Hospital. Nicholas Witchell and co did an outstanding job of thinning out such little news over a long period of time. Although you would be forgiven for thinking no other news had happened. Come 4.24pm and with Kay Burley still preparing an interview with the Royal baby, none of the worlds media were aware that the Prince of Cambridge had been born. The same news headlines that had dominated the day continued well into the evening until presenters, reporters, correspondents and viewers were greeted with the most rewarding scene of the day. A man walking out of the hospital door. At that moment, breaking news straps, interruptions to normal programmes and a media frenzy began. Over three hours of secrets kept away from the public eye and TV news broke into a spontaneous royal outburst. Interviews with anyone available. Doctors, photographers, tourists and even kids in royal themed pyjamas padded out a further two hours of repeated news coverage. By 9pm, the news had been broken around the globe. “Huge crowds” gathered at Buckingham Palace proclaimed newsreaders. 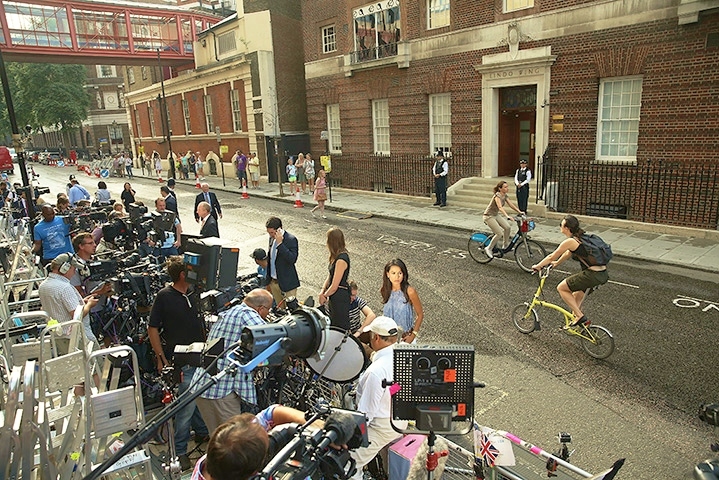 Indeed the tradition of a hospital bulletin being posted in the forecourt of the palace was a grand spectacle of theatre for television viewers. The excitement from the hospital and other relevant locations from around the country, even a horse in a pub, did provide a sense of relief that the waiting ordeal was over. After ten minutes of hurtling around the UK for reaction, the novelty soon dried. Everyone was “delighted” at the birth, including Her Majesty, The Prince of Wales and The Obamas; Even the Prime Minister made an unsurprising appearance from Downing Street to congratulate the couple on their “brand new baby” in comparison to perhaps a brand new car. Special news programmes ditched the schedules. BBC News once again dominated for another two hours on BBC One. Over on ITV, Grandmas who had been waiting for Long Lost Family were left despondent by the appearance of Mary Nightingale and an ITV News Special before the News at Ten O’clock which repeated, in summary, the news we had been subject to for most of the evening. In respect, both the BBC and ITV pitched up a programme featuring it’s main presenters and full package of reports, an example of outstanding preparation. ITV was the victor in the league of special programmes with 3.5m viewers tuning in. The BBC One programme held onto 2.9m viewers. Come 10.30 and following the excitement of the days event and the end of the regional news, you would presume that would be the end of programming about the Royal birth. Not quite. BBC One altered its schedule again to welcome a Sophie Raworth presented programme, Born to be King, a pre-recorded documentary looking to what the new baby can expect in it’s role. Come 11.15pm and the television ordeal, for many, is over. Mainstream channels returned to their late night schedules. The following day. A similar story. This time, the long awaited appearance of The Duke and Duchess of Cambridge with their new baby. As I write this blog at 4.50pm there is no sighting of the family yet. The nearest excitement has been a visit from the Middleton parents. And with news to suggest the couple and baby may not leave until after 6pm, possibly the next morning, it seems the worlds media is in for another trying evening, padding out hours of broadcast with the same news until the prized presence of the Royals. Although there probably has been too much TV coverage for the birth of the new baby, it has done digital news channels a huge favour. All day coverage on Monday saw BBC News take a 2.8% boost and Sky News a 1.6% share. Whilst such little news being panned over a long period of time frustrated many, it is true the event is very historic for the country. What the rolling news channels and special programmes did create was a sense of celebration, theatre and national pride. An example of excellent and historic journalism. 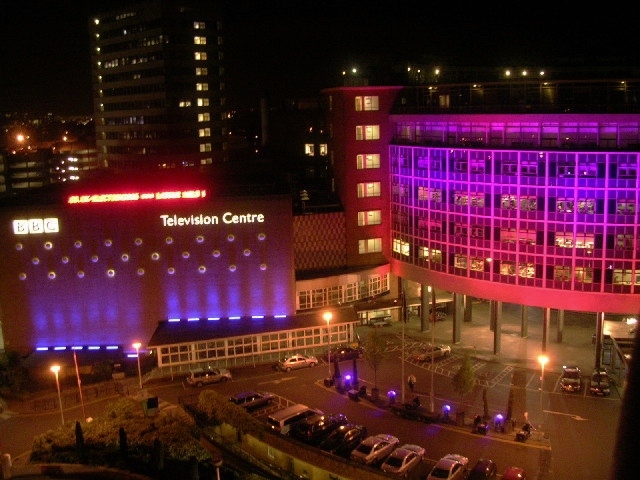 A fond farewell to Television Centre ? It is hard to imagine but at one point in time the majority of the BBC’s central departments such as news, sport and drama were all based under one iconic roof – Television Centre. Now, however, after 54 years at the heart of West London and as a symbol of the BBC, the building is to close, being sold for redevelopment. When I first heard the news, I admit I did question the decision. Why would the national broadcaster of Great Britain close one of the most recognisable buildings in the country? However, since that decision, the BBC has changed and now the corporation has based various departments around the UK. Last Sunday saw the final BBC News bulletin come live from Television Centre, before they themselves relocated to a new home. But it isn’t the first relocation. Departments such as drama and comedy have moved to locations including Cardiff and Glasgow, whilst the biggest relocation of BBC departments has been to the new Media City UK in Salford, where BBC Sport, Breakfast and CBBC (amongst others) are now based. I can say I have had the pleasure of visiting Media City and it is a brilliant working environment to be a part of. The modern surroundings, leisure attractions and the Manchester Ship Canal offer an unrivalled media environment. The new buildings are large, modern and a reflection of the new era for the BBC. 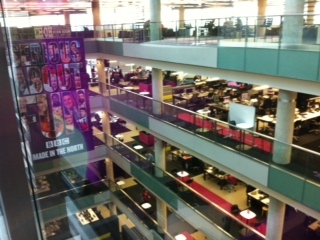 The open plan and ‘airy’ atmosphere in Quay House allow BBC Sport, BBC Breakfast, Radio 5 Live and other departments to work together in a building which offers excitement and evidence of the new digital era for media innovation. It is these new buildings and relocations which will be the new history of the BBC. Official figures already show that tourism in Salford is up for the seventh year on the row, with visitors travelling to see the new redevelopment. It is the relocation of the broadcaster and indeed other media organisations which are transforming the media industry. Away from the London centric representation that has portrayed the BBC in the past, the corporation is now one which is based and created from all corners of the UK. Not only is money being saved for the corporation but new talent is being discovered from around the United Kingdom. Departments such as BBC News will remain in London, at the new headquarters at New Broadcasting House, for obvious reasons. The selling of possibly the most iconic media building in the UK may lead you to ask where some of the programmes previously filmed at ‘TVC’ will be rehomed. Well, although the centre is being redeveloped and sold on, some of the larger TV studios will remain. 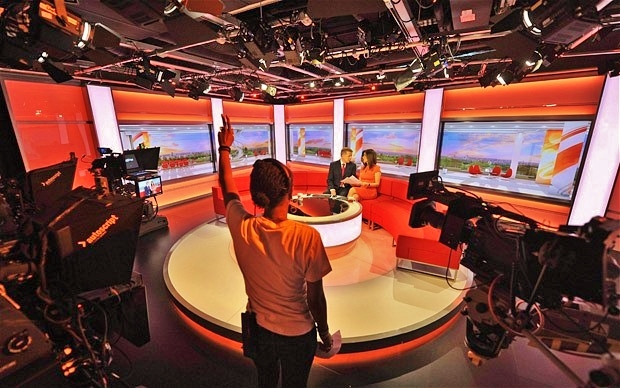 The BBC, alongside other broadcasters and independent companies will be able to hire out or rent the studio – a cheaper alternative than owning the buildings than house the studios. This method of filming is already in place at “The Studios” in Salford where the BBC does not own studios for the likes of CBBC and Match of the Day. However, the BBC does have an increased stake than other broadcasters and companies, so that regular programmes can be permanently based and filmed. So when I think back to the news that Television Centre will be closed, yes it will be sad to see the national broadcaster leave their iconic home. However, the next era of the BBC is to be created around the UK in new and plush working environments. But will any of these rival the iconic ring in West London? Only history will tell.